In 1947, 110 would be Royal Marine Commandos embarked upon a nationwide, five-day long, “personal initiative” test. Taking the initiative test was a very serious matter for the men, passing out as a fully-fledged Commando would depend upon it, but for the officers who designed and set the bizarre tasks it was a lot more fun. On Thursday May 8th each man was given individual task and ordered to reach their destinations, complete their task, and return with proof that they had done so, on or before Tuesday May 13th. To make things more difficult the men weren’t allowed to begin the test until the last train of the night had left the local station, Towyn in Wales (now Tywyn). None of the men had received any pay for nearly a fortnight, and they were not given any money. They were however issued with five days’ worth of iron rations to sustain them. And so off they went into the darkness, in groups of two or three, to disperse across the country and attempt to complete their individual tasks. One of the men was assigned to “Spend a night in the Chamber of Horrors at Madame Tussaud’s”. Getting to London with no money and in the middle of the night must have been a gruelling task. Requesting free admission and an overnight stay at Tussaud’s would have been even more difficult. Spending the night with images of Dr Crippen, Burke & Hare, Marat, models of torture etc may not have been pleasant but I think I would admire him most for having managed to endure the time-honoured queues. 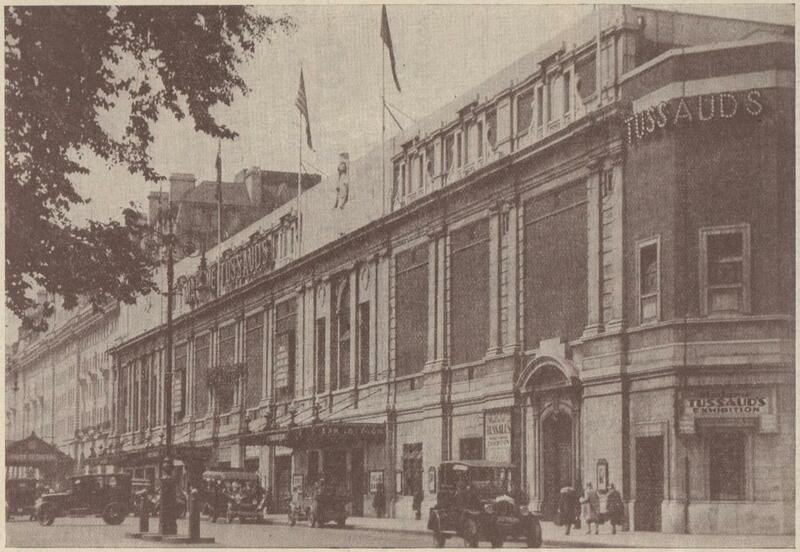 Above is an exceptionally rare queue-free image, it comes from Tussaud’s 1934 guide and catalogue. Find out the population of three villages whose names are pronounced like ” Who” ,” Why,” and “When”. I can’t find any record of whether the man assigned to spend a night in The Chamber of Horrors at Madame Tussaud’s was successful but I did find one local newspaper report concerning another one of the tasks. Royal Marine Commando J. Dougall, of Glasgow, called at Skechley[sic] Dye Works, Hinckley, Lancs.,[sic] yesterday. He asked to have his handkerchief dyed pink. He also asked for a photograph of the prettiest girl working for the firm. He succeeded in the first quest. But, as to the second, Miss Jose Pratt unsuccessfully searched her handbag for a photo, and he had to make do with a copy of the works’ magazine. Dougall, had journeyed 150 miles across country on iron rations, with 5s in his pocket. He was performing his passing-out test from a training centre in Wales. It included this test of personal initiative. There doesn’t seem to be any record of whether the picture in the works’ magazine was deemed satisfactory. If you know anything about this story, the man assigned to spend the night in Tussaud’s or any of the others please share your recollections in the comments below. This post relied on the story from the Sunday Post 11/5/1947 & from another in the The Evening Telegraph – Monday 12/5/1947, both were found via the wonderful British Newspaper Archive.